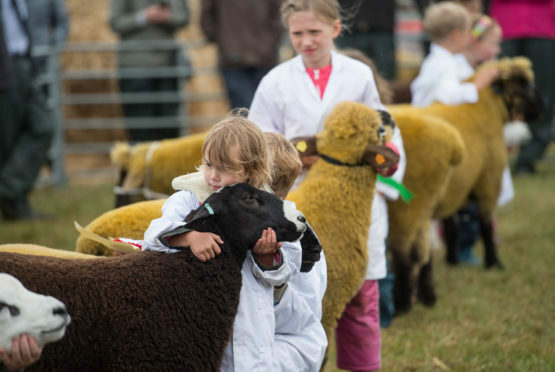 Sheep and cattle took centre stage at the Keith Country Show. More than 600 entries were finely groomed to look their best for the final day of the 147th Keith Country Show. Farmers and their beasts took centre stage in the town as the fruits of months of hard work getting animals in prime condition were showcased. And there were local winners in the champion of champions parade for the Scottish Beef Cattle Championship. Aberdeen Angus heifer Ballindalloch Ebony, shown by David and Susan Johnstone from Ballindalloch Home Farm – home to the oldest herd of the breed in the world – was chosen as the best in the native cattle class by judge Dougie MacBeath from Stirling. Meanwhile, Charolais cow Battleford Lola, shown by Garry Patterson from Keith, was picked as the best in the continental class – before going on to claim the overall title. A Limousin heifer owned by Michael Robertson, from Fodderletter Farms in Tomintoul, was chosen as the best commercial. Judging for the classes began in the pens early in the morning as the adjudicators selected the best in breed while the thousands of spectators were entertained by adrenaline-fuelled quadbike stunts in the main ring. The audience around the showground built through the afternoon before the beasts in the champion of champions parade were led in by their handlers. Show president Jim Matthew believes the variety of attractions at the event ensures that thousands are attracted back every year. He said: “Whether people are showing livestock, dogs, vintage trucks or running a trade stand, we always make improvements to the showground. “The biggest factor is always the visiting public though. “Without people paying to come there would be no show to enjoy. Moray MSP Richard Lochhead discussed farming issues with NFU Scotland president Andrew McCornick at the event. He said: “I congratulate the organisers for another successful show even if the weather wasn’t as kind as it might have been. “The prize-winning livestock was as impressive as ever and that only serves to illustrate the importance of livestock farming to Moray.